Data are calculated and processed on a daily basis through computers in business, at home, and in education. Data are essentially the raw facts that are usually typed into a computer. We call these "raw" facts due to them being unorganized. They can come in any form from audio and visual, to text and numerical. When the data is entered into the computer, it is considered input. The computer calculates the data and spits out the information. Since this information is the output, it becomes the organized version of what used to be raw facts. This system is considered information processing. Data can also come in other forms including figures, experiments, and surveys. Most everything that is entered into a computer becomes data, which is why this term is so vital to understanding computers and how they operate. 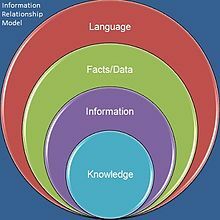 Information is produced by the data; it is form of knowledge, and computers calculate detailed information. When most people think of information, the first source that comes to mind is Google. Google allows you to access a lot of information in a short amount of time. What most do not know is that is exactly what a computer does behind the scenes every time you are entering data into a computer, most of the time without even considering it to be "data." Information is a way to get answers to questions, because they are the output of the data you have put in to process. Many online sources provide endless amounts of information. Without information, people will not have reliable sources for school and their career. Work can be made much easier with information, including jobs which need to calculate employee's total hours worked, or any "total data" that needs to be found or calculated. Data and information are very valuable, and is most certainly the backbone of a computer. These two components may help your computer to be user-friendly by working behind what you are typing to make data useful and organized. The Industrial Age: First general mechanical computer was proposed and partially built by the English inventor Charles Babbage in 1837. It was an Analytical Engine which contained an Arithmetic Logic Unit (ALU) and permitted basic programmatic flow control. It was programmed using punch cards, and also featured integrated memory. Historians consider it to be the first design concept of a general-purpose computer. Unfortunately, because of funding issues the Analytical Engine was never built while Babbage was alive. It wasn't until 1910 that Henry Babbage, Charles Babbage's youngest son, was able to complete a portion of this machine which was able to perform basic calculations. The Analytical Engine was to be a general-purpose, fully program-controlled, automatic mechanical digital computer. It was designed to consist of four components: the mill, the store, the reader, and the printer- which are all essential components of every computer today. The Information Age (beginning in 1950 until current): Also known as the Computer Age, Digital Age, or New Media Age. Digital computing was invented by Claude Shannon in late 1950's. What he envisioned was a computer built from electrical circuits instead of motors. By drawing on Boolean algebra — which assigns the value of “1” to “true” statements and the value of “0” to “false” statements — he applied the value of “1” to circuits turned on, and the value of “0” to circuits that were off. Shannon also pioneered the field of information theory, which addresses the issue of how to quantify information, as in “bits” and “bytes.” To express information in a “bit,” one uses a binary digit, either a “1” or a “0.” These binary digits can describe everything from words to pictures to songs to videos to the most sophisticated gaming software. Today, it is difficult for any student to imagine life without a computer. However, computers have only been around since the mid 1900's. The computer industry went from making computers that took up an entire classroom to currently being able to fit into a student's backpack. Also, computers used to be much more expensive and required a greater amount of energy than today's computers. Finally, in the 1980s, people began placing these foreign objects into their home. During this time, people had to really study and be patient with this handy device. People have seen the drastic changes that have been made to computers in a span of only forty years. Computers today are much smaller, lighter, require less energy, and cheaper. However, in today's generation, computers are second nature to most people, and one could not imagine life without them. An open computer case displaying the hardware. Computers in our generation seem to be integrated in our every day life to assist in multiple tasks related to our many needs. So much so, it is difficult to picture our world without them. However, with great success comes great patience. In the first computer model (1946-1957) for example, the machine required certain inputs, referred to as punch cards, and physical work to reprogram the computer. The computer itself was nowhere near as helpful, simple, nor convenient as it is today. The first generation computers were built with thousands of vacuum tubes, required physical effort to re-wire the computer, and could only solve one problem at a time. The second generation of computers (1958-1963) introduced transistors, which replaced the vacuum tubes. Transistors simply acted as a light switch, allowing the electronic circuits to either open or close. Both first generation computers, and second generation computers continued to use punch cards for their input. Second generation computers also introduced hard drives (hardware), and programming languages (FORTAN & COBOL). Soon after, (1964-1970), the third generation used a system of integrated circuits, which incorporated many transistors and electronic circuits on a single silicon chip. The third generation of computers started the innovative trend of smaller and more reliable computers. Keyboards and monitors were now considered the computer’s input/output. Finally, the development of our current computers, used by practically everyone in society, began. The fourth generation of computers began in 1971, when it was possible to place far more transistors onto a single chip- the microprocessor. 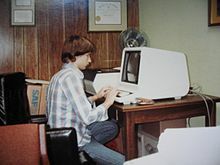 This discovery led within the decade to the creation of IBM's personal computers, as well as the popular Apple Macintosh. Consumers currently use inputs, outputs, and storage that consist of: keyboards, mice, monitors, printers, speakers, hard drives, flash memory media, and optical disks. Fifth generation computing devices, based on artificial intelligence, are still in development, though there are some applications, such as voice recognition, that are being used today. The use of parallel processing and superconductors is helping to make artificial intelligence a reality. Quantum computation and molecular and nanotechnology will radically change the face of computers in years to come. The goal of fifth-generation computing is to develop devices that respond to natural language input and are capable of learning and self-organization. Although the movement from vacuum tubes to microprocessors seemed to take a while, compared to the beginning of civilization thousands of years ago, this advancement happened very quickly. However, it also opens the human mind to realize that innovation takes trial, error, and patience. 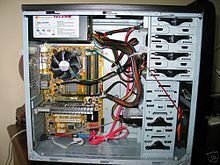 A computer case is used to put the essential components of a computer in. This provides an enclosed space and easier organization for the components to go. A power supply unit (PSU) is used to power all components inside the case. It does this by converting AC power to DC power that is regulated by the PSU. What this means is that each component needs a certain amount of volts to work and the power supply will regulate the volts accordingly. An expansion card is used to enhance certain attributes of the system. For example, a sound card can enhance sound by giving you surround sound capability. Another example is a video card, this will enhance the graphics of your system. This category refers to the components a computer uses that receive data and send information. Input devices do the receiving and the output devices do the sending. Some examples of input devices are a keyboard, mouse, and a gaming controller. Examples of output devices are a printer, monitor, and speakers. The memory within a computer can be broken down into two categories: short term memory and long term memory. Short term memory is the random access memory (RAM) while the long term is either your hard disk drive (HDD) or compact disk drive (CDD). RAM can be tapped into immediately by programs on a computer allowing it to compute faster, but if the user needs to save information for later use, using the HDD or CDD is required. The central processing unit (CPU) is used to calculate the commands sent to it by the programs used on the system. It performs all the arithmetic and logical operations. This comes in the form of a small chip that is connected into the computer motherboard. The motherboard is where all other devices are connected so they can speak with each other. An example of a wireless router. Communications hardware is important when it comes to letting computer users access information from the Internet, put information onto the Internet, or interact with other computer users on a network. This type of hardware includes modems, routers, and network adapters. Modems and routers are the devices that connect computer users to the Internet: Signals go from the Internet service provider to the modem, which then converts them into an appropriate form and sends them through the router to the computer (or, when the computer user is sending information to the Internet, signals are sent via the router to the modem, which converts them and sends them to the Internet service provider.) 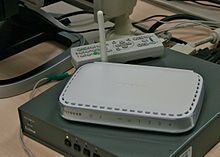 Modems and routers can be either wired or, increasingly commonly, wireless, communicating with the computer via signals rather than a physical connection. Network adapters are what allow computers to communicate on a small, local network. Sometimes, however, a computer may have a network adapter that consists entirely of software, called a virtual adapter. If this is in use, such as on a virtual private network (VPN), then no hardware component is needed. Diagram displaying how software communicates with the user. Computer software is used to communicate with the computer processor to direct certain operations to be performed. This is done through computer programming languages. Software can be broken into two parts: System Software and Application Software. System software refers to the software used to operate the computer components. This also provides a foundation for application software, giving it the ability to carry out the desired functions. System software commonly comes on a system CD, for example a Windows 7 CD. This CD provides the operating system, drivers, Windows system, and utility software. 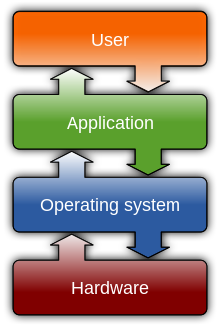 The operating system allows the parts of the computer to communicate. This is done by transferring data. This is also the specific component of system software that allows for the running of application software. Utility software maintains the computer systems. Device drivers set up the ability for the hardware connected to the computer to function. Windows systems is the part that gives you a graphical interface on your monitor and allows the user to configure all connected devices. Application software are the programs and applications that are developed to carry out desired functions by the user. The way an application works is through programming software. Programming software is the middle man between the system and the actual application the user wants to run. Some examples of programming languages are Java, C++, and Visual Basic. Some examples of application software are web browsers and video games. Two gentlemen discussing programming ideas. Computers are nothing without the people that use them, the common user and the professional. The common user is anyone that uses the computer for general purposes. This includes checking emails, playing computer games, typing up a paper, and the list goes on. What distinguishes a common user from a professional is that a professional works in the field of computer information technology. 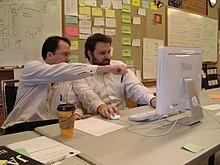 Examples of professions in this field are a computer programmer, web designer, network administrator, and software engineer. These are but a few of the many jobs involved in the field of computer information technology. These are the people that design the hardware to build computers, they keep business networks secure, they program software to communicate effectively with the user and hardware, and develop the latest and greatest software for the common user to enjoy. This page was last edited on 21 June 2018, at 12:09.